An iPod Touch is a portable electronic device that has the capacity to hold movie files, music files, photo files and data files. Users not only enjoy music on iPod shuffle or iPod classic, they can also watch iTunes videos on iPod Touch. You can follow the see how to play iTunes movies on iPod here. First, launch iTunes on your computer, connect iPod with the computer via iPod USB cable, then look for the iPod listed under "Device" in the left panel of the iTunes screen. Select the iPod. Last click the "Movies" tab on the main iTunes screen. Put a check by "Sync music," put a check by "Include music videos" and click "Apply". When you see "iPod sync is complete", the transfer is done. However, the above guide is not available for all users. iTunes Rentals or other iTunes videos may not be played on iPod Touch freely. 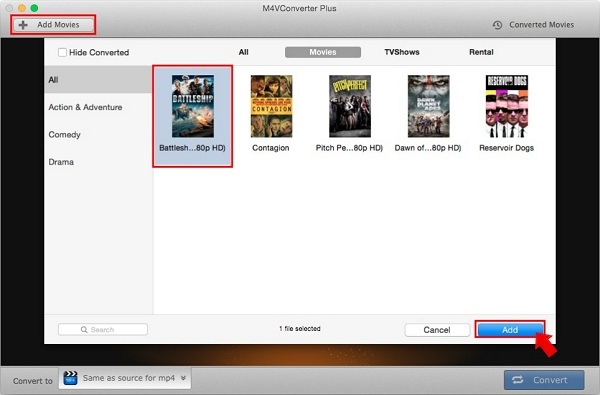 And you may ask how to convert iTunes M4V video to iPod video format, especially iTunes purchased movies and iTunes Rentals. Don't worry, M4V Converter Plus comes to help you. It is a powerful yet professional M4V to iPod converter, which supports converting M4V to MP4, MOV, FLV, AVI, MP3, AAC and other popular video and audio formats perfectly. With it, you can finish the M4V to iPod conversion process with a few clicks. And it makes M4V to iPod conversion routine very simple and fast. Also, it almost has no loss of the quality of your iTunes M4V videos. Step 1: Add M4V movies to convert. 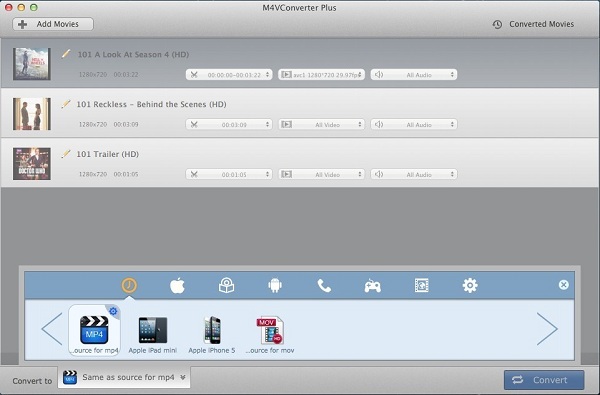 Free download M4V Converter Plus for Mac, install and run it. Click Add Movies button, search your purchased M4V or rent M4V according name, then select the files, click Add button to load all the videos. Step 2: Select the right output preset for iPod. In the Convert to drop-down list, select Same as source for MP4 in profile drop-down list. You can also directly choose Apple iPod Touch from Apple Device. Click Convert button to start the M4V to MP4 for iPod converting. After finishing converting M4V to iPod, you can play the converted iTunes M4V files on iPod at will.